Everyone and their mother believed that this would be Rex Ryan’s last season as the Jets head coach. With an offense littered with question marks, and defense that saw its front office trade away the best cornerback of his generation, and maybe the best Jets defensive player of all time in Darrelle Revis, how could Ryan possibly succeed? Despite all the mitigating circumstances, Ryan has this team at 5-4 and is winning the way he always believed he could, on the back of his defense. This is not the same style of Jets defenses the NFL has seen in the early years of the Rex Ryan era. Let’s take a look at the film from their shocking upset win over the Saints to examine what is different, what is working, and how they could stand to get even better despite ranking in the top ten amongst defenses statistically. One of the bigger questions facing the Jets defense in the offseason was who would man the nose tackle spot in Rex Ryan’s traditionally 3-4 defensive scheme. Longtime veteran starter Sione Pouha was released in March and 2011 third round pick Kendrick Ellis had never really asserted himself as a starting caliber player. Little did they know, they were sitting on a gold mine in a 2012 undrafted player out of William Penn University, Damon Harrison. The player teammates have nicknamed “Big Snacks” is ranked as Pro Football Focus’ fourth best interior defensive tackle and the highest ranked primarily 3-4 nose tackle on the list (subscription required). His emergence as a dominant player has changed this defensive front. Richardson is able to use his impressive athleticism to track the running back down from behind and make the stop. Sheldon Richardson makes the play, but it is all set up by the attention Damon “Big Snacks” Harrison commands from the opposition. Landry is able to break on the ball and while he is unable to make the interception himself, he tips the pass in the air and linebacker DeMario Davis picks it off. The first Brees interception is yet another example of a play that will not show up in the stat sheet for him, but is made mostly by the efforts of the best nose tackle you have never heard of, Damon “Big Snacks” Harrison. So much of success on the defensive side of the ball is having all eleven players playing at a high level at the same time; it is very difficult to mask weak personnel with just one level of the defense. What is crazy about the Jets defense is that they are doing just that. The Jets linebackers are merely decent, their edge pass rush has mostly struggled to get pressure on their own, and their secondary has failed to cover at the level we are used to seeing from Jets defenses. Everything the Jets defense is doing is all based off the success of their three man defensive line, the previously highlighted Damon Harrison, Muhammad Wilkerson, and Sheldon Richardson. They are an elite group and the work they do upfront makes everyone else on the defense’s lives easier. That pocket movement from Brees moves him right into the path of Muhammad Wilkerson who has left both of his blockers in the dust. 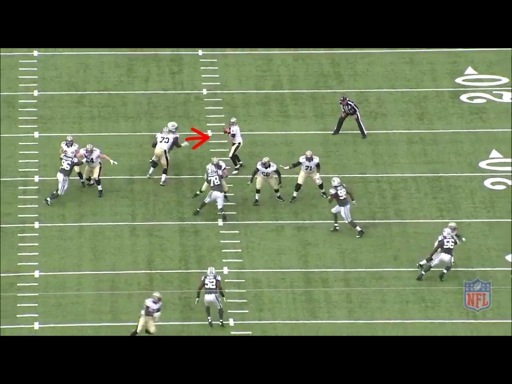 Wilkerson has a perfect angle on Brees, who stands no chance at avoiding the charging defensive lineman. The result of the play is a nine yard sack, courtesy of the soon to be All-Pro defensive lineman. Because of the time it took to execute the stunt, Richardson does not get home for the sack on Brees, who has one of the quickest release times in the league. However, the pressure that Richardson puts right in front of Brees causes the quarterback to fire an inaccurate pass to Jimmy Graham that falls incomplete. 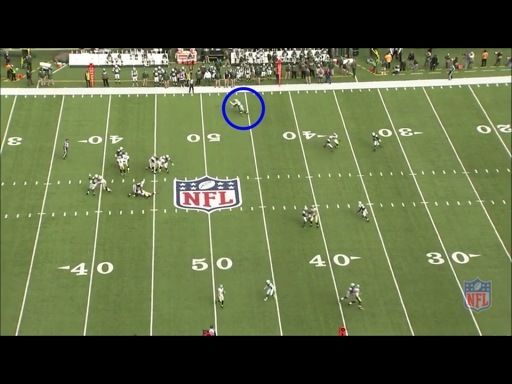 Milliner is able to get to Thomas just as the ball arrives and athletically knocks the ball down for an incompletion. 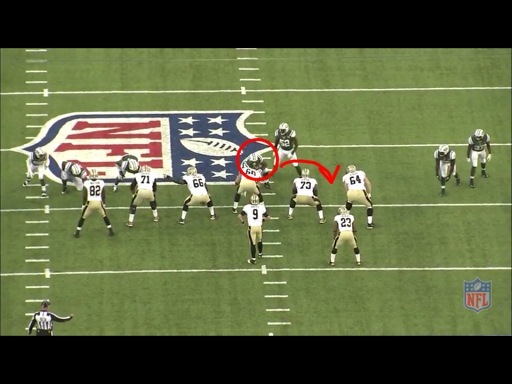 The way the rookie reads the eyes of Brees and the decision-making he displays on this play were reminiscent of a veteran cornerback. The only thing Milliner fails to do on this play is actually haul in that first interception. Milliner knows he has an easy pick here and no doubt the thought of his first career interception probably gave the rookie jitters and the ball bounces off his hands. Fortunately for Milliner and the Jets the ball bounces right into ball hawk Antonio Cromartie’s reach and he makes the interception. Unfortunately for everyone but the Saints, this play is called back due to a defensive holding penalty on a safety assigned to cover Jimmy Graham. Milliner missed an opportunity here, but nevertheless, this play shows the growth of this top ten pick, and the veteran discipline he played with against the Saints. 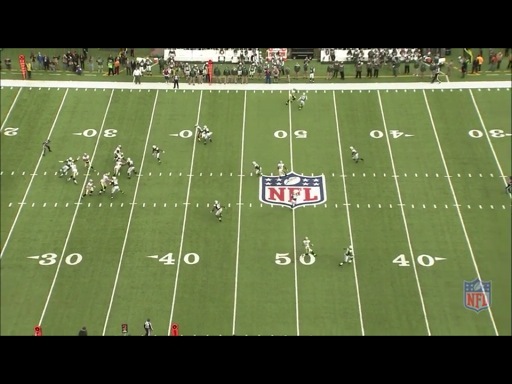 If the Jets can get this type of play from Milliner for the rest of the season, look out. The athletic difference between Graham and Allen is not even worth discussion. Brees sees that not only does Graham have Allen beat by at least a yard and a half, but also just how much real estate Graham has in front of him. Brees hits Graham and the result is 51-yard touchdown. The Jets defense is doing a lot right at the moment, but with the move to more zone coverage, they could really use some upgrades at safety. Because Harris has so much depth here, Graham is unable to keep taking his route down the field, and cannot box out Harris or cut back because Coples is right in front of him. Graham’s only choice is to take his route further to the sideline. 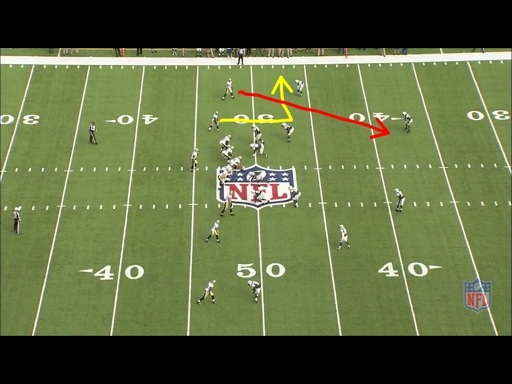 Unfortunately, that does not leave Brees enough room to make the throw, and the pass sails out of bounds. Rex Ryan was able to identify a weakness in his defense of the Saints offense, and did what great coaches do; fix it mid-game. While Rex has the benefit of some really talented players in his front seven, he is certainly not working with a stocked cupboard on the defensive side of the ball. Rex is the brain of that defense and makes all the parts move just as they need to. His masterful work on defense has the Jets carrying a shocking winning record and should absolutely be enough to ensure his future with the Jets beyond the 2013 season.